While "terminating sanctions" are extreme and very rare, Apple believes Samsung's actions warrant such a punishment and call the leak of excluded exhibits to media outlets an act of "egregious" misconduct. 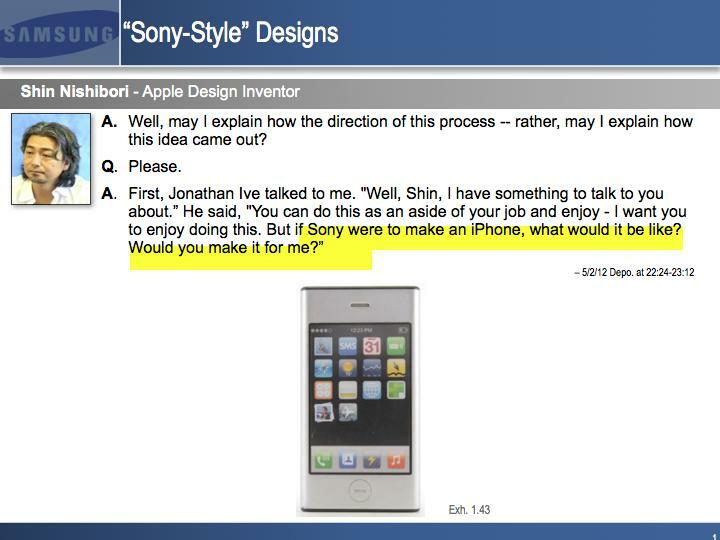 Samsung on Tuesday sent out an email to various media outlets containing demonstrative exhibits featuring text of a deposition from former Apple designer Shin Nishibori which mentions a "Sony-styled" iPhone. Presiding Judge Lucy Koh excluded the evidence from the case in an earlier order. To go along with the media packet, Samsung issued a statement which read in part, "the excluded evidence would have established beyond doubt that Samsung did not copy the iPhone design." In a declaration from Samsung attorney John Quinn, it was revealed that he green-lit the email and statement but claimed both were within the limits set forth by the Court and not meant to sway jury bias. Apple, on the other hand, claims Quinn's actions were intently directed at the jury and "impugned the integrity of the Court." Mr. Quinn made clear Samsungs position on whether it would respect the Courts determinations during arguments on July 31. Confronted with the Courts decision to exclude the disputed evidence (after multiple failed motions for reconsideration), Mr. Quinn challenged, Whats the point . . . of having the trial? Whats the point? Samsung then took its Whats the point? message to the publicclaiming that the Court was improperly denying Samsung a fair trial. The declaration goes on to note Samsung's press statement is the latest in a "string of litigation misconduct" of which Apple points out four examples including the spoliation of evidence related to the Korean electronics giant's email deletion protocols. For the reasons described, Apple requested the Court hand down "severe sanctions" against Samsung for "bad faith conduct" especially pertaining to the press leak debacle. The iPhone maker claims "no remedy other than judgment on Apple's phone design patent claims could fully rectify the harm that Samsung and Mr. Quinn have caused," noting exclusionary sanctions or a mistrial would be insufficient and possibly harmful to its case.